This is the third case study in a series on territorial tax systems in other countries. The intent of the study is to see what lessons the U.S. can learn from other countries’ experiences and to evaluate the validity of some of the fears critics express when discussing what would result if the U.S. were to move to a territorial system. According to the OECD, the unemployment rate ticked up slightly in 2010 and 2011, rising to meet the OECD average (Figure 1, above). 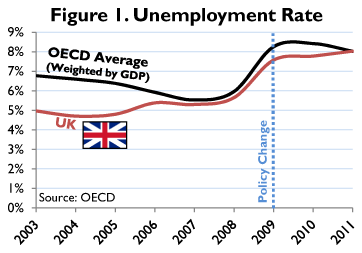 However, if we look closer at the latest data from the British government, we see that unemployment has generally leveled off since the July 2009 policy change (Figure 2, above). The worsening Euro crisis has stalled economic growth for the UK and its trading partners, but labor outcomes in the UK have not appreciably deteriorated since the inception of territorial treatment of foreign income. 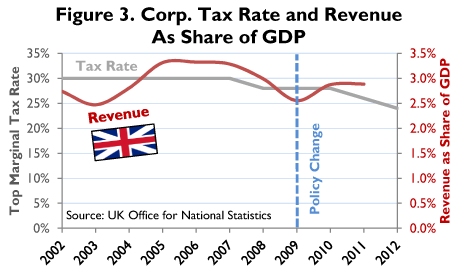 Since the policy change in 2009, corporate tax receipts have increased despite a tax rate cut in 2011 (Figure 3). Again, this is not to suggest that the territorial system caused the revenue increase—particularly because the policy change was concurrent with GDP growth recovery. Nonetheless, revenue has only increased since the transition to territorial taxation. 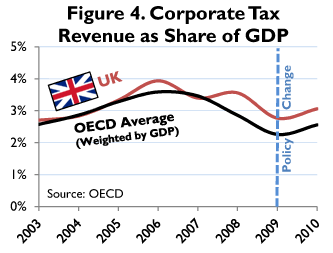 OECD statistics on revenue as a share of GDP also confirm that it increased in 2010, the first year after the policy changed, in line with the OECD trend (Figure 4). See Kevin S. Markle, A Comparison of the Tax-motivated Income Shifting of Multinationals in Territorial and Worldwide Countries (Oxford University Centre for Business Taxation, Working Paper 12/06, Nov. 2010), at note 7, http://eureka.bodleian.ox.ac.uk/3199/1/WP_12_06.pdf. For qualifications for exemption, see Joint Committee on Taxation, Background and Selected Issues Related to the U.S. International Tax System and Systems that Exempt Foreign Business Income (May 20, 2011), at 42, http://www.jct.gov/publications.html?func=startdown&id=2793.